This is is the second essay in the Composer of Prophecy series which closely examines Rhaegar’s involvement in the the prophecy of the promised prince and how he may have covertly ‘stored’ it in the song which is informally known as “Jenny’s song”. I’ve highlighted the words haunting and evocative, because I think they are an example of accidentally revealing language on Martin’s part. I certainly can’t hinge any serious theory off of Martin’s word choice, but these idle comments can absolutely complement an otherwise compelling idea. I bring this comment from GRRM up now because I will return to it a few times throughout this essay. So why do women and men seem to have different reactions to Rhaegar’s music? I’ve argued that Rhaegar may likely be performing the same song (Jenny’s song) over and over at these performances, an idea that may be disputed. In any case, the idea of a gender-based reaction to his music seems to be well established. Men just aren’t listening to Rhaegar’s music. Men glean the same meaning from the song as women, but just don’t care about it as much. Men are failing to pick up on a subtext in the song that the women are indeed catching. The first two could happen no matter the song or circumstance. What interests me is the third possibility: that men are incapable of seeing something in the song that the women are, a hidden subtext that exists between the words. Barristan Selmy was regularly in Rhaegar’s presence and heard his music often, but the best he could do was ‘feel’ that there was something else concealed in the words. And yet it seems that even women who barely know Rhaegar can be brought to tears by his song. Since this is a subject clearly delineated by genders and gender roles, the most obvious answer would be something related to what women are uniquely capable of: birthing and raising of children and related issues. The significance of the relationship between a son and mother is the hidden subtext in Rhaegar’s music. The significance of the relationship between a son and mother is the hidden subtext in Jenny’s song. The idea that men would be unable to understand the mother-son relationship and its significance might seem far-fetched. But that’s applying contemporary reasoning. In Westerosi culture, it would be quite easy for most men (particularly the nobles with their schemes and games) to overlook the important spiritual bond between mothers and their sons. As you can see here, Catelyn makes it clear that she protects her children fiercely… as any mother would. In a sense, what emerges is the notion that the mother protects the sons, so that they can in turn grow and one day protect their own wives and daughters. The absolutely breathtaking bit here is when Brienne says “As ladies die in childbed. No one sings songs about them.” If you are a believer that Lyanna died giving birth to Jon Snow the promised prince and that Rhaegar’s song was actually the prophecy of the promised prince, then Brienne was in fact entirely wrong. Evocative generally means “to bring powerful images or memories to mind”. In this light, Martin’s statement seems flatly wrong, because he is a very vivid writer: he has no overt struggle with conveying imagery, taste, etc. both plainly and veiled in metaphor. People often laugh at his long descriptions. This is obviously my opinion, but I feel that what Martin really means here is that he couldn’t find lines that worked for the imagery he wanted to convey. In particular what this reveals is that the imagery would have been easy, but the prose was not. The suggestion of so precise a relationship between the meaning and the text suggest Martin could not happily establish a subtext that he wanted. And he is a master of subtext. Women perceive a subtext in Rhaegar’s music, one concerning the special relationship between a mother and her sons. Traditional Westerosi gender roles prevent men from perceiving this subtext. To which I respond, he had a woman (The Ghost of High Heart) telling him what to write essentially. Although this is the only line of Jenny’s song that is known, I believe it appears more than once throughout the song. How on earth can I justify that idea with so little to go on? There are a noticeable number of situations in the books that conspicuously mirror the details in the line. A pattern emerges from the observations: one that supports the larger themes of the books and seems to occur naturally without excessive reader invention. These findings suggest deliberation on Martin’s part. Consequently, I believe this is not just the first line of the entire song, it is a refrain and appears multiple times. I further believe that examining the pattern that emerges from these studies allows for very compelling and insightful hypotheses about future events. Halls of the kings who are gone. This suggests the castles and keeps of former kings, like ruins or castles of kings who have since fled or submitted to greater kings. High in the halls. This would suggest atop towers or at least the highest floor in a relational sense: high places in the aforementioned keeps and castles. Ghosts. This suggests the presence of ‘ghosts’, which could be literal, figurative or somewhere between those two points. Notice that there is a plurality of halls, kings and ghosts. Sure, it could very well only mean one place, but it could also mean multiple places. I specifically believe in the latter case: there are multiple halls, kings and ghosts that fit the line from the song, and that each is important. What about the mention of Jenny? Wouldn’t that be another important element to look for? This very well could be the case, but I would like to hold discussion of the connection between Jenny and my findings for a moment. Here are those ‘situations’ that I’ve found match the line from Jenny’s song to an eerie degree. Some of the situations are less certain than others, I’ve used question marks indicate when there is some uncertainty. The Ghost of High Heart / Summerhall — She was obviously at Summerhall for some time (the ‘Shadow of Summerhall’), and clearly was fond of Jenny. Being a ghost in name and in history (everyone thinks she died during the Tragedy of Summerhall), it makes perfect sense to consider her a qualifying ghost. Summerhall is clearly a former hall of kings. 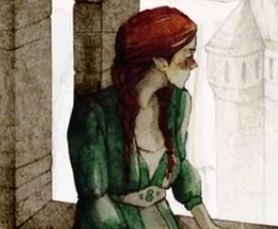 Alannys Harlaw / Pyke — Asha makes several comments about how Alannys seems more like a ghost than her mother. Indeed Alannys would wander the towers at Pyke during the night, calling out for her lost sons. She seems completely disconnected from the real world like a ghost. Lady Stoneheart / Oldstones — Stoneheart is quite literally undead, a revenant brought back to ‘life’ courtesy of Beric’s magic. Oldstones is a seat of former kings; indeed Catelyn herself specifically calls it a ‘hall of kings’ at one point. Joanna Lannister / Sept of Baelor — Her ghost appears to visit Jaime in a dream in A Feast for Crows. However she insists it is not a dream, something Jaime subsequently agrees with. Interestingly, the “non-dream” happens at the Sept of Baelor, where the bones of the dead Targaryen kings are interred below. Ghost(s) in Winterfell?? / Winterfell Crypts — Between the missing swords, Theon’s musings, the spearwives and the bizarre dreams Ned and Jon have, it’s clear that the crypts of Winterfell are ‘portentous’ to say the least. The crypts are clearly a set of halls housing the remains of long dead kings. What’s novel here is that the highest level contains the tombs of the most recently dead Starks. Ghost at the Eyrie?? / The Eyrie — Most notably, the Eyrie even has a “High Hall”. Although there is never any clear evidence of any ghost at the Eyrie, it’s rather odd that Marillion keeps playing songs about women losing their sons and other mournful songs. Even more odd is that Robert Arryn continues to hear the singing in his dreams after Marillion is killed. Ghost in Harrenhal?? / Harrenhal — Harrenhal clearly has at least one high ‘hall’ that is unequivocally associated with ghosts, the Wailing Tower. Further we know that Arya liked to consider herself the ‘Ghost in Harrenhal’. There of course may be more. We have several good specific matches (Alannys, Stoneheart and Joanna) and several vague ones (Winterfell, Harrenhal and the Eyrie). These are on top of the self-evident mention of the Ghost of High Heart and Summerhall. We need to look at the data we have and see if a pattern emerges. Can we create a hypothesis to test against the other, uncertain entries? I believe the answer is ‘Yes‘. First, what do all three of the ‘good’, specific candidates have in common? All of them are “dead” in one sense or another. Perhaps this is too particular, but they are all mothers to POV characters, and their sons were separated from them at an early age. For lack of a better word, I’d like to replace “dead” with cursed, in the sense that these mothers seem to remain in some sort of unhappy purgatory after the loss/separation of their children. The line appears multiple times in the song. It refers to mothers who are cursed after being separated from their children (sons in particular). Specifically it refers to mothers who are somehow associated with the halls of former kings. So with that idea in mind, could the other vague entries on the list actually be ‘nonliving’, cursed mothers as well? Can we think of prospective ghosts to fill in these blanks? Ghost of Winterfell. The best candidate here is Lyanna Stark, assuming you believe that she is mother to Jon Snow. It’s thematically consistent with everything I’ve just said. She is buried on the highest ‘hall’ of the Winterfell crypts, she has no sword so by Stark custom her ‘spirit’ might be free to roam, and so forth. Ghost of the Eyrie. Lysa Tully makes the most sense here, as it is a perfect fit for the ‘requirements’ I just pitched. Further, it would make sense of all the bizarre things happening at the Eyrie after her death and how they seem to dwell on the relationship between a mother and her son. Ghost of Harrenhal. This remains a mystery, since we know of no mother who might ‘haunt’ Harrenhal, concerned over a son she left behind. If such a thing existed it would have to be someone we don’t know or a person we didn’t know was once at Harrenhal. In any case, the hypothesis concerning mothers and sons seems to hold, curiously well. Perhaps its not just a hypothesis, but the truth? For any skeptics of the Lyanna and Lysa suggestions, I have written extensively in multiple essays about the existence of ghosts, plausible or otherwise in ASOIAF. You can read them if you desire additional context in support of ghosts, here and here. You would weep as well if you had a son and lost him, Sam almost said. The hypothesis is interesting because it certainly corresponds with so many characters involved in the story: Theon, Jon, Jaime and Bran are all prominent sons who have ‘lost’ their mothers early in life under unfortunate circumstances. Was this a clever pun, a lyrical statement, or perhaps a subconscious slip of the tongue? I find it odd because it would be one thing for the song’s in-world author to mention ‘dancing with ghosts’, but its another when our actual author Martin says he wanted the song to sound ‘haunting’: he’s conflating his role as the story’s author with the role of the song’s writer. This is substantiated by other element’s of Martin’s statement: Martin cut the other verses he wrote out of dissatisfaction, and blamed himself for it. Couldn’t he have simply attributed any ‘bad verses’ to the song’s in-world author and moved on? Here he betrays an authorial overlap between himself and whoever wrote the song. In essence, this admission actually highlights the importance of Jenny’s song to the story. Collectively, things just fits too well to simply be dismissed as a reader’s imaginings. The Ghost of High Heart may be a ‘ghost’, but there is no evidence that she ever had children at all. This seems like it invalidates the hypothesis. I have previously argued that “Jenny’s song” served two purposes; one was to record the Ghost’s prophecies, and the other was to slake the Ghost’s desire to commemorate Jenny. I think in this case we have an example of the layered nature of the song: The Ghost of High Heart and Summerhall fit because it was Rhaegar shoehorning her into a song which really encapsulated her prophecies. In other words, she fits with the actual text of the song (the lyrics) because the song was written for the Ghost, but she does not fit with the subtext concerning the prophecy. There are many ‘ghosts’ that appear to have prominent associations with halls of kings who are gone. There are so many occurrences matching the words of Jenny’s song it suggests that the words are possibly a refrain. These occurrences are also neatly consistent with themes and/or motifs that are pervasive in the books: the relationship between mothers and sons and the spiritual damage inflicted by a tear in that bond. It therefore seems unlikely that this is a wishful interpretation of the song. So I left two ominous gaps in the previous section… Jenny of Oldstones herself and Harrenhal. Where do they fit in the prophecy? To be honest I’m not sure, but I have a fun theory that Jenny was not at Summerhall during the tragedy. I think its entirely possible that she was at Harrenhal nursing a newborn son when the tragedy happened. She committed suicide after arranging for someone to take her child somewhere safe from vengeful Targaryen pursuit: north of the Wall. That son would grow to be Mance Rayder. You can read about this idea in my essay The Red Sun Rises, The Glass Candle Burns: The Lost Targaryen Prince. Note: The landing gear are up at this point, valmorphanization is complete. While I like the ideas in this section, I’m not sure it will convince anyone. I have written a few essays recently that raised as many questions as they answered. One of which suggested that Rhaegar’s Harp was in Winterfell and would be the tool needed to communicate with the Others. Well, it’s possible that Mance might play it for him. Jon and Sansa visit the Others together, and she plays the harp to pacify them. Sansa has a life history that makes this thematically compelling. First of all, let me point something out: Sansa was right where Littlefinger was wrong. Sansa appears to be convinced that ‘life is not a song’. So in a way, this encounter with the Hound proved that a song could be indeed quite powerful, powerful enough to stay a blade and save a life. Further, in another instance of men not understanding Rhaegar’s music, if Jenny’s song is indeed a telling of prophecy then life is a song – quite literally. Maybe not a happy song, but a song nonetheless. What’s most striking about all of this is that Sansa has been shown to have calmed a lost (broken) man with her voice and a song. She made him see his humanity when he could not. In addition to being one of the only people who thematically has the right belief in songs and faith in heroes, Sansa also possesses the right qualities to sing Rhaegar’s song and use the harp. Arya makes a curious note of this, specifically in reference to Jenny’s song! So the singer played for her, so soft and sad that Arya only heard snatches of the words, though the tune was half-familiar. Sansa would know it, I bet. Her sister had known all the songs, and she could even play a little, and sing so sweetly. All I could ever do was shout the words. Additionally, Sansa had been taking high harp lessons which in King’s Landing, after the Tyrells took her under their wing. “Sansa did the same, though few singers ever cared to make the long journey north to Winterfell.” I told her there would be singers at the king’s court, though. I told her she would hear music of all sorts, that her father could find some master to help her learn the high harp. Oh, gods forgive me . . . I can’t put my finger on it, but it just seems like Sansa’s specific affinity for songs, and the explicit references to her musical ability and to her knowledge of Jenny’s song, suggest it may be something of future importance. Genius absolute genius. by far my favorite asoiaf essay writer and amazing analysis. Each are timeless and each better then the last!!! where are you getting that descriptions of the song? A quick look at the wiki and my own memory serves to say it’s about the actual Dance of Dragons that happened. As in the Targ civil war 170 years before the books. Excellent essay. I believe you are mistaken about the identity of the Ghost of Winterfell. If there is one, you would expect it would be Ned Stark’s mother, who – leaping here – is the woman Bran sees before the heart tree, praying for a son to avenge her. Lyarra Stark, mother of Brandon, Ned, Lyanna, Benjen, prays for a son to avenge her. Thank you for pointing out the connection here: Winterfell, the Eyrie, and Harrenhal. Why would Lyarra Stark need vengeance? We can’t be sure, but if we think about Ned’s early life we know of only a few events. Recall that Jon Arryn’s suggestion to send Sweetrobin away as a ward? Lysa – more or less – murdered Jon over this suggestion. The Eyrie is where Ned Stark was fostered. Brandon was also raised away from Winterfell. Does the grieving woman miss her sons? I cannot tell you how overjoyed I am to have stumbled upon your blog from that reddit post. This is brilliant, absolutely brilliant. Reading your theories, speculations, and analyses literally gives me chills. Now to tear through the rest of this blog. You have made my work day that much more exciting. I actually wrote an old post on /r/asoiaf that specifically compared Baelish to Heathcliff, with the final suggestion that Jon and Sansa might pair off like first cousins in Wuthering Heights. Every time I see the term ‘high harp’ in your essays, I can’t help but think ‘High Heart’…Seems deliberate to me. Great stuff!